July | 2017 | The Glyn Watkins Show Page. Celebrating words, pictures & pies, inc. Bradford, Bishop Blaise, J.B.Priestley, Kipling & pylons. The Glyn Watkins Show Page. Vintage Film and Bus Tour of Bradford Tickets available now from Record Cafe and Sparrow, North Parade! Should be available from Sparrow Bier Cafe soon. £10 for the bus. Glyn will be doing a short talk about Priestley, starting at 18.30. Free entry. Wednesday 13th September (J.B.Priestley’s birthday). Glyn Watkins presents readings, pictures, stories and Samantha Wass in the role of Annie Parker (I’ve had to listen to hours and hours of all your dreary talk!). Featuring meat and potato pie and peas (vegetarian alternative available); and a bit of a brass band. Plus a free £5 bet. ONLY £10 for the lot! Call 01274 391820 for tickets. There is full disability access but the event is restricted to over 18’s only. Vintage Film and Bus Tour of Bradford. £15 for a film followed by a bus tour. Combined tickets from The Sparrow Bier Cafe or the Record Cafe, North Parade, Bradford. Starting at 11.00 with a showing of Lost City the BBC’s rarely shown film of J.B.Priestley’s 1958 visit to Bradford. Followed by boarding a vintage bus for a tour of Priestley’s birthplace and other sites seen in the film. Including a stop for refreshment at The Mucky Duck Frizinghall, and Bradford Playhouse, where Priestley was president for many years. The tour will finish by or before 17.00 between the Sparrow and Record on North Parade. #pieandpriestley Bringing the Pie to The People. Hockney 80th, Lister Park. Brilliant celebration of a genius: who drew the best portrait of J.B.Priestley. Bringing The Pie to The People. #pieandpriestley Bradford Park Avenue v Bradford City. Stan’s won 3-0. 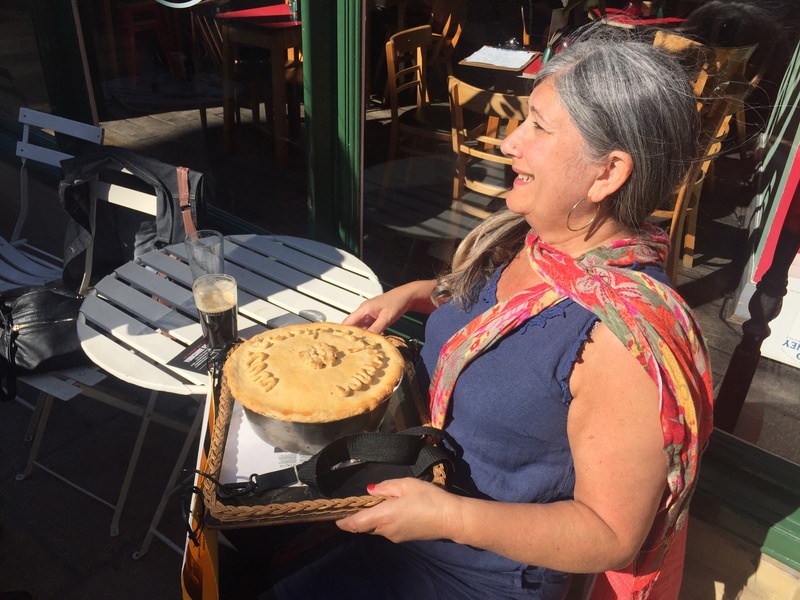 Salamander Brewery confirm support for The Little Pie and Priestley Festival. Spot my pie! Red Room Coffee House. Business meeting and When We Are Married read through wi Samantha. Brilliant Bring Back Blaise’s Wool Festival. My baby is grown.